Tzannes were initially engaged to review and refine the guidelines as part of a collaborative team involving participation by the client, Council and AJC. Tzannes prepared an Urban Design Report which provided a detailed urban design analysis of Johnston Street and environs. The Report proposed amendments to the Development Guidelines and resolved a number of inconsistencies in the document. Council resolved to convert the draft Development Guidelines, along with the amendments proposed by Tzannes, into Council’s DCP. This collaborative strategy and our ‘first principles’ urban design analysis resulted in the approval of a site specific DCP and a subsequent Development Application with variations to numerous development standards including an FSR of 2.8 times the area’s DCP control. 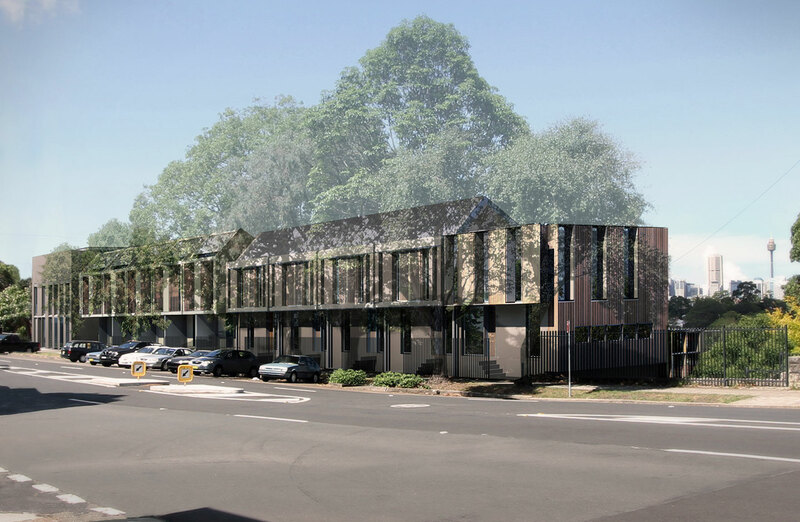 The proposed architectural design sought to provide a restrained, refined and respectful contribution to the streetscape of Johnston Street. Over the site, a number of architectural typologies were developed to respond to differing contextual requirements. On Johnston Street, two groups of terraces were designed in a contemporary language which adopts and interprets the distinctive historic elements characteristic of this area. 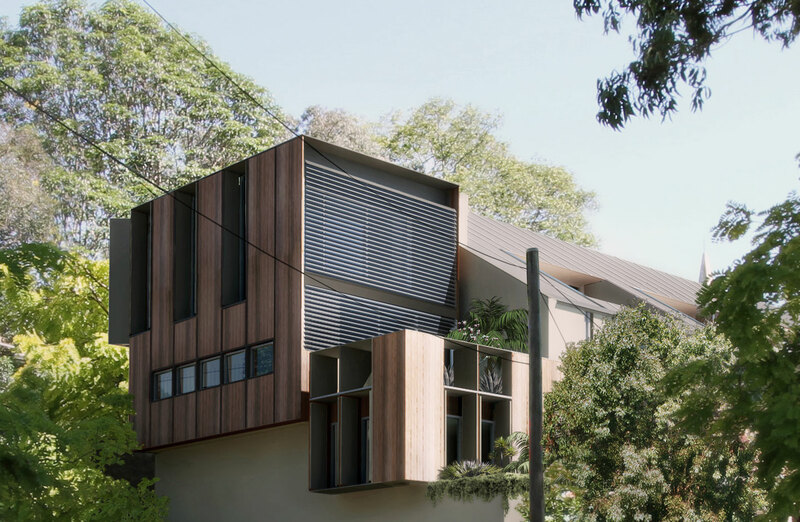 A new split level dwelling was proposed for an undeveloped part of the property which presents as a heavy single storey masonry base, with a floating lightweight roof. The front balcony is deeply recessed under a gable roof, of which the size, location and form is consistent with the prevalent dormers elsewhere in the street. The proposal preserves privacy for both new and existing residents through deeply setback planters and privacy planting in the terrace gardens. Important public views from a significant site were protected as part of the development of the building envelope.